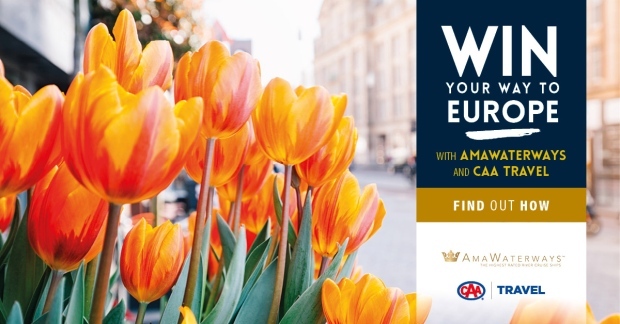 CAA Travel and AmaWaterways want to send you and a friend on a seven-night luxury river cruise in Europe! For centuries, Europe’s rivers have been a source of inspiration for writers, poets and musicians. Now, it’s your turn to be inspired. Let AmaWaterways introduce you to a world where dramatic sights are met with luxury. Enter todays promo code below for your chance to win and good luck! 1. Watch CTV News on the local cable or satellite channel in your area from Monday, April 15, 2019 to Friday, April 26, 2019 to view the Contest spot and watch for the Contest Clue posed during the program (each a "[Contest Clue/Trivia Question]"). 2. To enter the CAA Travel & AmaWaterways contest (the “Contest”) simply visit the website located at www.ctvottawa.ca (“the Contest Website"), click on the Contest page, complete and submit your entry by following the instructions found on the Contest page. If you have registered for a CTV Username and password on a previous occasion, you may enter the Contest for a prize by completing the online entry, using your CTV Username and password. If you do not have a CTV Username and password, sign up for one by filling out the online entry form with your first name, last name, home (mailing address), email address, ten digit daytime and evening telephone number and date of birth. In the event of a dispute, entries received on-line shall be deemed to be submitted by the "Authorized Account Holder" of the email address submitted at the time of entry. "Authorized Account Holder" is defined as the natural person who is assigned to an e-mail address by an internet access provider, on-line service provider, or other organization (e.g. business, educational institution, etc.) that is responsible for assigning e-mail addresses for the domain associated with the submitted e-mail address. All entries must include your first and last name, address, email address, age and the correct answer to the Contest Clue posed. Limit of one (1) entry per individual per phase. If it is discovered that you attempted to enter more than once per phase, all your entries will be void. Contest starts at 6:00 p.m. Eastern Time ("ET") on Monday, April 15, 2019 and closes on Friday, April 26, 2019 at 10:00 p.m. ET (the “Contest Period”). There is one (1) grand prize (each, a "Prize") to be won from among all the eligible entries received during the Contest Period. No purchase necessary. Void where prohibited and restricted by law. 3. The contest sponsors are Bell Media Inc., CAA Travel and AmaWaterways (hereinafter referred to as the “Contest Sponsors”). 4. To enter and to be eligible to win, entrant must be a legal resident of Canada (excluding Quebec) and be twenty-one (21) years of age or older. Employees and their parents, siblings and children, and persons domiciled with an employee of any of the Contest Sponsors, their respective agents, parent, affiliated or related companies, subsidiaries, divisions, prize sponsors, and promotional and advertising agencies and administrators, are ineligible to enter. I. 7-night luxury river cruise for two (2) (valid for base category stateroom on any Europe or Mekong itinerary, excluding Portugal). Redeemable for travel in 2019 (excluding May and September). Departure date subject to availability. II. Round trip economy air fare for two (2) from Ottawa. Must be booked return Ottawa only. Winner will need to provide their own transportation to/from Ottawa. Flights must be economy. gratuities and onboard incidentals are not included and are the responsibility of the passenger(s). This cruise certificate is not exchangeable against other cruises; offer is not combinable with any other promotions and/or discounts; certificate is non-transferable and has no cash value. For Travel Agent: To redeem complimentary cruise, please send a copy of this cruise certificate along with your complete contact information via email for verification to res@amawaterways.com. Based on the specifications listed on the cruise certificate, please provide up to 3 cruise choices in order of preference. Should all 3 choices be unavailable, we will suggest an alternative sailing based on the same specifications. Not included in this package are passport/visa fees where applicable, travel insurance, return transportation to your home airport, beverages and meals not detailed in the itinerary, excess baggage fees, pre and post trip hotel accommodations (if required), optional excursions and personal expenses. 6. Prize must be accepted as awarded. The Prize may not be sold, transferred and is not convertible to cash, except for those that consist of cash. Contest Sponsors reserve the right to substitute the Prize in whole or in part in the event that all or any component of the Prize is unavailable. Prize winner is solely responsible for all costs not expressly described herein. No change in travel arrangements can be made by the winner once the booking has been confirmed. The Prize may not be used towards any type of frequent flyer mileage, or other reward point accumulation program. responsibility in this regard. The provisions and procedures referred to above relating to selection and notification of a potential winner shall be applied, with the necessary amendments, until a qualified winner has been duly selected. 8. By entering this Contest the entrants and participants automatically agree to accept and abide by these Rules. All decisions of the Contest Sponsors with respect to any aspect of this Contest, including without limitation the eligibility of entries, are final and binding on all entrants in all matters as they relate to this Contest. 9. Contest Sponsors assume no responsibility for garbled, lost, late, delayed, destroyed or misdirected mail, voice messages, e-mail or any computer errors or malfunctions. No correspondence will be entered into except with entrants requesting Rules by mail or requesting names of prize winner (for which a self-addressed, postage paid envelope must be included). Contest Sponsors do not assume any responsibility for incorrect or inaccurate capture of entry information, technical malfunctions, human or technical error, seeding or printing errors, lost, delayed or garbled data or transmissions, omission, interruption, deletion, defect or failures of any telephone or computer line or network, computer equipment, software or any combination thereof. Entry materials-data that have been tampered with or altered are void. If for any reason, in the opinion of the Contest Sponsors, in their sole discretion, the Contest is not capable of running as originally planned, or if the administration, security, fairness, integrity or the proper conduct of the Contest is corrupted or adversely affected, including by reason of infection by computer virus, bugs, tampering, unauthorized intervention, fraud, technical failures or any other causes beyond their control, Contest Sponsors reserve their right to cancel, terminate, modify, amend, extend or suspend the Contest including canceling any method of entry (if more than one method of entry), and select a winner from previously received eligible entries. Contest Sponsors reserve their right to modify the Rules without materially affecting the terms and conditions hereof. The Contest Sponsors reserve their right in their sole discretion to disqualify any individual they find to be tampering with the entry process or the operation of the Contest or to be acting in violation of the Rules or otherwise in a disruptive manner. Contest Sponsors in their sole discretion, further reserve their right to terminate the on-line portion, as applicable, of the Contest and conduct the drawing from all on-line entries and all other entries (as applicable) previously received during the Contest Period. Any attempts to deliberately damage the Contest web site or to undermine the legitimate operation of this Contest is a violation of criminal and civil laws and should such an attempt be made the Contest Sponsors reserve their right to seek remedies and damages to the fullest extent of the law. Contest Sponsors shall not be held responsible for any errors or negligence that may arise or occur in connection with the Contest including any damage to an entrant’s computer equipment, system, software or any combination thereof, as a result of their participation in this Contest or from downloading any material from the Contest web site, where applicable. 7-night luxury river cruise for two (2) (valid for base category stateroom on any Europe or Mekong itinerary, excluding Portugal). Redeemable for travel in 2019 (excluding May and September). Departure date subject to availability. Round trip economy air fare for two (2) from Ottawa. Must be booked return Ottawa only. Winner will need to provide their own transportation to/from Ottawa. Flights must be economy.